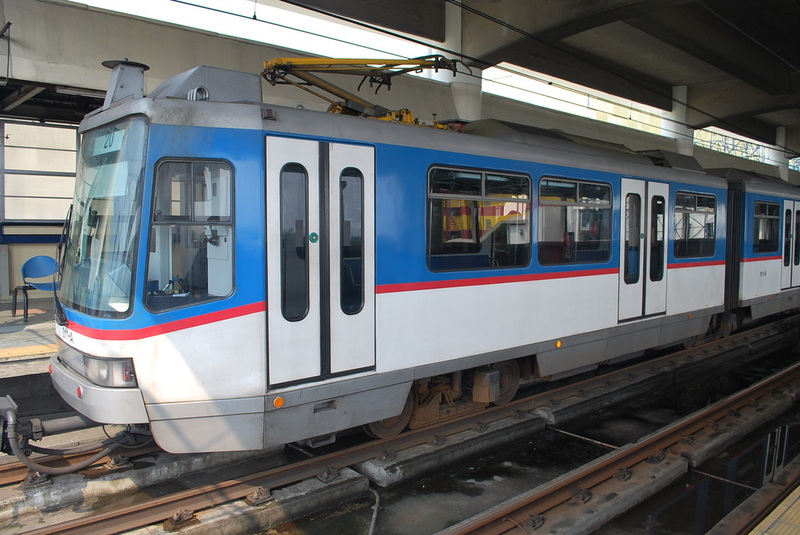 The rail project has a fleet of 73 Czech-made modern and air-conditioned rail cars, of which up to 60, in three-car trains, will be operating daily during hours. The trains were built by CKD Doprovni System of Prague, the Czech Republic. 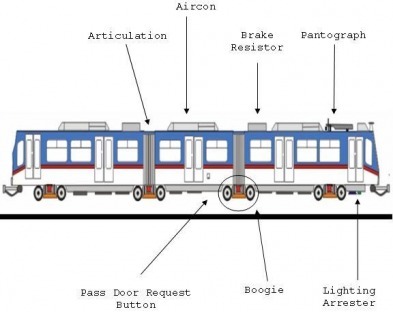 The rail vehicles are articulated, eight-axle , three-section cars, designed for single-ended operations. 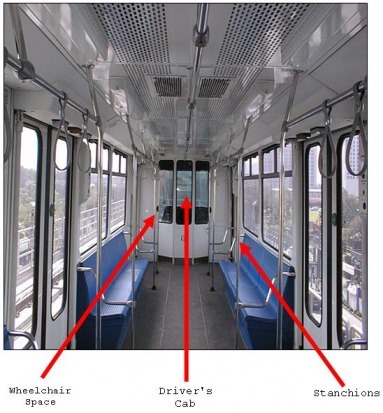 Each rail car is provided with five double leaf, electronically-operated, plug-sliding doors. The three center doors have an open width of 1,255 millimeters (mm.) while the two end doors, 861 mm. 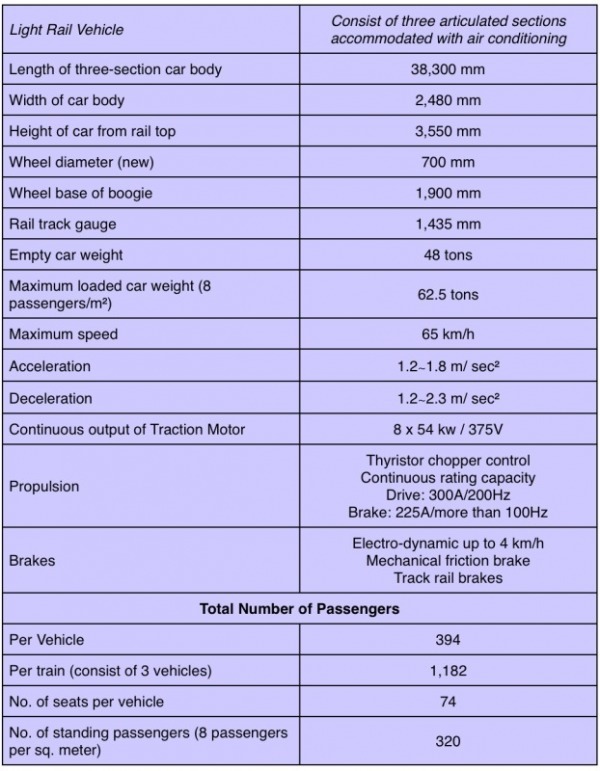 Each train can seat 80 passengers and carry, under crush loading conditions, 394 commuters at any one time. The MRT3 trains can carry 23,000 passengers per hour per direction daily. 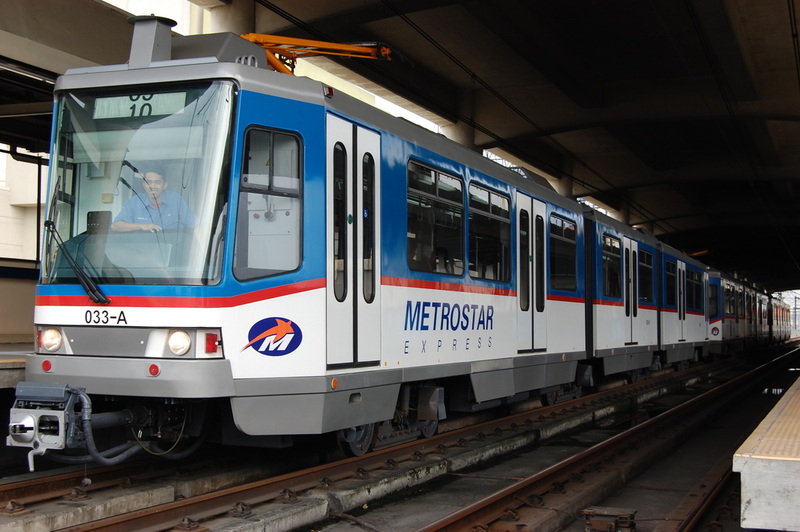 The rail coaches are also air and noise pollution-free and run on electricity from MERALCO. 34.5 kilovolts AC Power is provided at the eight traction electrification substations at North Avenue, Kamuning, Santolan Road, Ortigas Avenue, Guadalupe, Ayala Avenue, Magallanes Avenue and Taft Avenue. The trains run at a maximum speed of 65 kilometers per hour, enough to cover the rail system's tip in about 30 minutes, including short dwell times of about 25 to 35 seconds in each of the system's 13 stations. They run over standard rail tracks. 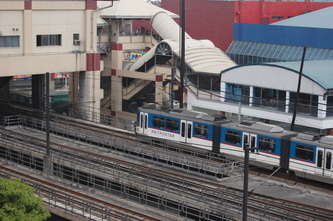 Aside from the two revenue tracks, a pocket track is located at he Shaw Blvd. Station for the temporary storage of disabled cars, for temporary storage of cars cut from the train consist during non-peak hours, or for mid-point train turn-backs where scheduling needs or passengers load dictates.